If you’re looking for a relaxed and friendly rural retreat from which to enjoy the beautiful Isle of Wight countryside, then High Pines B & B is for you. Adgestone is on the southeast of the island close to the village of Brading and about 2 miles from Sandown seafront. It is in an area of outstanding natural beauty with lovely woodland walks and some of the most spectacular views on the island, such as Culver Down. There is a wildlife hide just a few minutes walk away where you can watch red squirrels, woodpeckers and other birds. Easy access to bridleways, footpaths and cycle paths make this an ideal location for walkers and cyclists. Alternatively, relax on the nearby sandy beaches or visit the many local attractions such as the Steam Railway, Roman Villa, Garlic Farm and Adgestone Vineyard. Sandown and Shanklin Golf Club with its challenging County Championship course is a short distance away. The nearby villages of Brading and Newchurch both have pubs serving excellent food. Numerous first class restaurants are also within easy reach. We have two large first floor guest rooms. One is available with either twin or super king beds and has a bath with shower. The other has a king size bed with shower. Both rooms are warm and pampering, the beds so comfortable and the nights so quiet that you may find it difficult to get up for breakfast, which is normally served in the privacy of your room. There is plenty of choice and is made with the best of local seasonal produce. Vegetarian and gluten-free (coeliac) diets are easily catered for. 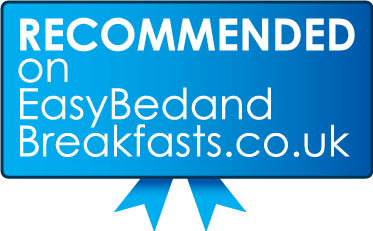 Click Bed And Breakfast - Britain's premier Bed and Breakfast guide.